Have just got back home from a very wet Gomstock. Gomstock is a small, local festival ran by The Compasses pub in Gomshall and is a good collection of local talent. We went along to support our friend, John Peppard, who is basically a songwriter (who has written for people like Garth Brooks and Michael McDonald amongst others) but also a mega talented guitarist. 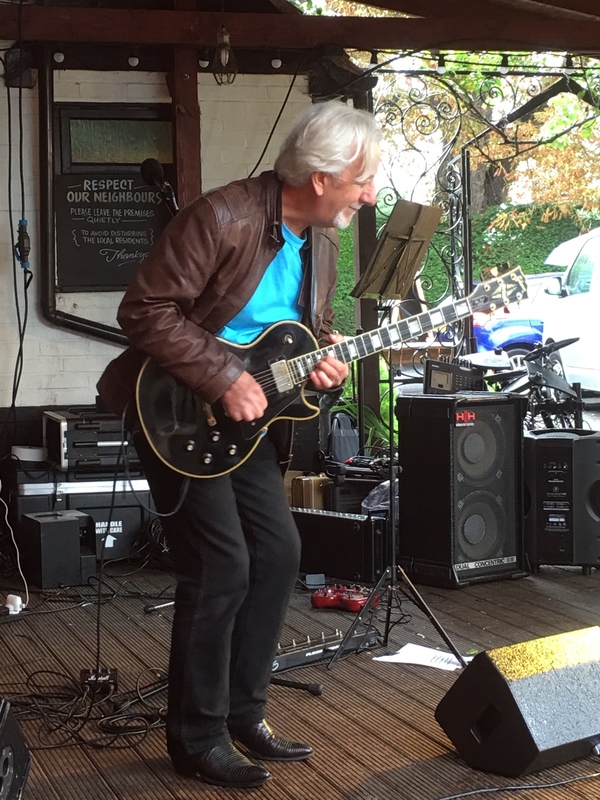 He played a great covers set of popular numbers, all of which showcased his gorgeous Les Paul to maximum effect, including a couple of great fun ZZ Top songs, Sweet Home Alabama in memory of Ed King, Parisienne Walkways, Alright Now, Comfy and Freebird. We we had every intention of staying for the whole afternoon but in view of the fact that it is heaving it down with rain here and the festival is held in the pubs lovely big garden (the stage area was under cover fortunately) we supported John’s set and then left. Have attached a photo of the great man at work (hopefully, as I am rubbish at posting pics! Looks like fun, he's getting some good "feels" there! Oh yes!! He certainly ‘gets the feeling’. That photo is quite tame for him! The minute he has his LP in his hands he comes alive. Shame about the weather, would have been a great day. Love the fact you've got the "Please leave quietly" sign in there ! @sticker that appealed to my sense of humour too! He sure was not quiet!! H|H dual concentrics! That brings back memories! they were not John’s, they belonged to the band that was on after him. They had loads of gear with them.